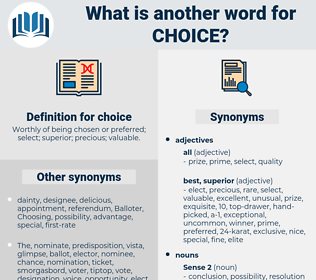 What is another word for choice? have your pick of something. directions, Judgments, rulings, discuss, choix, alternative, alternatives. predilection, chance, opting, designation, selectivity, alternative, alternatives. decided, opted, Existed, Wished, suggested, wanted, made. deciding, fixing, Choosing, Selecting, opting. decides, elects, wishes, likes, wants, sounds. selection, Selections, Choosing, Selecting, option, elections, chosen. selection, Choosing, discretion, Selecting, option, chosen, possibility, nomination, solution, trade-off, trade-offs, favorite, dilemma, thing, opportunity. common, worst, bad, inferior, unimportant, poor, sad, ordinary, unrefined. execrable, commercial, uncultivated, average, gross, raffish, coarse, necessity, commonplace, unpolished, uncultured, popular, vulgar, vile, kitsch, low-grade, lowbrow, pathetic, mass-produced, kitschy, rough. Among them all, the choice of our friend was the lady just mentioned. You have the choice before you."